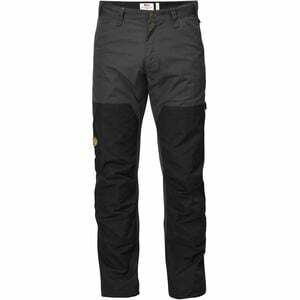 The Fjallraven Men's Barents Pro Pants offer the durability needed for trekking through dense brush and scrambling over rocky terrain. Its G-1000 fabric stands up to rocks and snagging branches while offering a classic look that fits in at your favorite caf. Reinforced panels on the thighs and knees add durability so your pants hold up year after year. Articulated knees give you the freedom to move, while openings for knee pads give you the option for extra protection. A variety of pockets give you ample storage for tools and hiking essentials to keep you moving in the right direction.